In terms of kindness, where do we stand as a nation? Perhaps not very well, if you base your judgement on a recent report about our Graciousness Index dropping 8 points to an all-time low of 53 in 2013. Sure, I have encountered my fair share of inconsiderate drivers on the roads as well as the occasional queue-cutters or the loud-mouthed phone user. However on the other end of the spectrum, I too have come across really friendly, kind and helpful people! Some time last year, my car was warded in the workshop ICU for close to 2 weeks due to some fault and our family of 5 had to take the public transport. And despite all the negativity that you read online today, kindness do exist in Singapore and I found that out through the numerous times that strangers had gave up their seats for my boys or wife (who was carrying Ale) in the buses or trains. And then there is the kind cleaning auntie at my housing estate, who never fails to greet residents with a beaming smile and a chirpy 'Good Morning!' Or the kopi auntie at Tiong Bahru Market who always engages the wifey and I in cheerful banter when we are there for breakfast on weekdays. These small acts of kindness may seem insignificant on their own but if you are the recipient of a kindness act, how can one not respond in thankfulness towards such friendliness, kindness and helpfulness? Kindness does breed kindness. 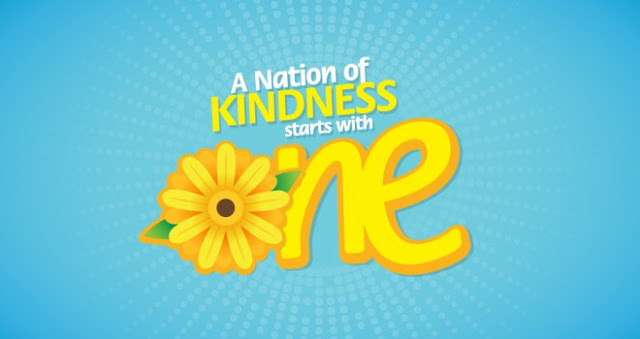 And it is with this in mind that the key message of the inaugural Kindness Day SG is A Nation of Kindness starts with ONE. The creation of a kinder and more gracious society cannot be journeyed alone; every single one in our society is innately kind and we should unlock this belief from within us and actively take a pro-social stance in practicing kindness and graciousness as we work towards a kinder and more gracious Singapore. Moving beyond the Singapore Kindness Movement’s established initiatives to encourage kindness, the inaugural Kindness Day SG held on 31 May 2013 at Clarke Quay not only hopes to encourage people in performing kind acts wherever they are, but also to reach out to businesses and organisations keen on inspiring the spread of kindness and bringing them onboard as partners. I was kindly invited down to attend the event and it kicked off with much fanfare with various drum and band performances. Nothing like a festive atmosphere to kick-start a year-long's desire to fuel the kindness spirit in Singapore! The day’s festivities then culminated in the lighting up of a giant floating gerbera daisy on the Singapore River, relaying the idea that a kinder Singapore starts with one. 5000 smaller rubber gerbera daisies were released into the river by the riverboats as well and in case you are wondering, the gerbera daisy symbolises kindness and appreciation. A successful movement can only be just that with great support from individuals and stakeholders. So it was fitting that the Singapore Kindness Movement unveiled its first Kindred Spirit Circle during the event as well. The Kindred Spirit Circle was created to affirm individuals and ground-up groups dedicated to spreading kindness for organising pro-social initiatives within their community. 21 groups and individuals were presented with certificates of appreciation and they were truly an inspiration to all. If you do know of any similar movements that have organised kindness activities within the last 12 months, feel free to share them with the Singapore Kindness Movement team at kindness@kindness.sg! Also a first - the kindness mocktail, concocted by the students from Shatec Institutes, was served to attendees of the event. Not too bad though I personally found it to be - pun intended - kind of sweet. The night then closed with the distribution of 2,000 daisy origami to passers-by as a reminder to pass on the kindness they receive, as well as a free river cruises to the event participants. Of course, kindness is never to be restricted on this single day itself. Kindness Day SG serves as a reminder, celebration, and continuing encouragement of kindness. All because an act of kindness goes a long way and can make a difference in somebody else's life; even your own, because it makes you a better person. So if you have experienced or witnessed any acts of kindness, do join in the Kindness Day SG sharing with photos, tweets or videos (hashtag #kindnessdaysg). Or you can post them up at its Facebook page to show your support too! For more inspirational stories on Kindness in Singapore, visit the Singapore Kindness Movement website! Let us all initiate the kindness tsunami, starting with ourselves. Because a nation of kindness truly starts with one.